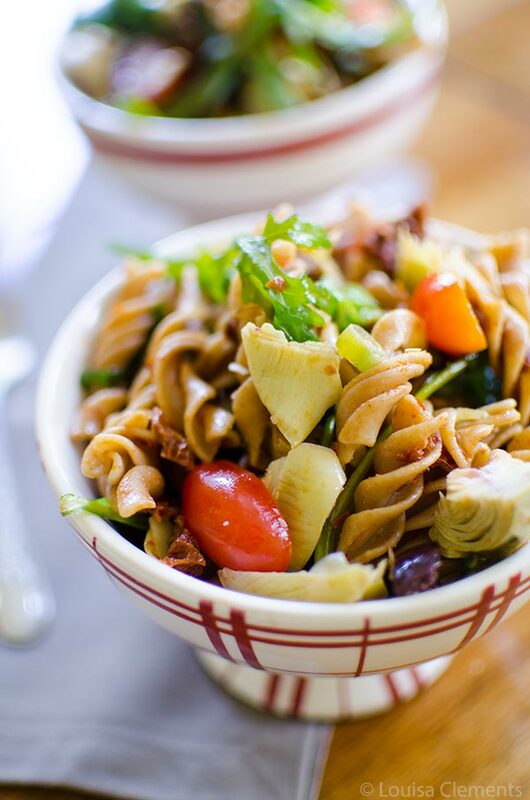 Mediterranean pasta salad highlights the flavours of Italy, like sun dried tomatoes and basil, for a delicious and healthy take on a North American classic. This Mediterranean pasta salad recipe might be the recipe of the summer. Ever since I made my antipasto sandwich, I’ve been on a huge arugula, sun dried tomato and artichoke kick– these three flavours are just a match made in heaven – and combining them with pasta (I used whole wheat, which I prefer) makes a simple and flavourful dish. After all, I think pasta salad is pretty much an essential summertime dish for potlucks and barbecues. And you know what, even as the summer is winding down, there is still plenty of time to invite your friends over for an afternoon on the patio or in the backyard. Mediterranean cuisine is known to be focused on simple cooking with an emphasis on plant-based meals with lots of fruits, vegetables, nuts, beans and you can’t forget olive oil. These ingredients pepper the recipes on this blog like my eggplant dip and my version of Greek salad. 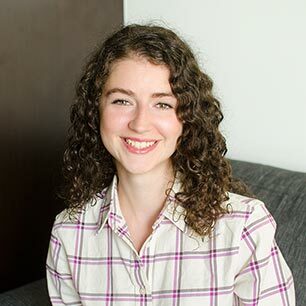 If this is your first time visiting Living Lou, you may not know that I’ve been spending my summers in Greece since I was three, on the island of Kefalonia, in the Ionian sea between Greece and Italy. It’s a picture perfect lush island; yellow and white sandy beaches, balmy temperatures, clear blue turquoise water, and pastel coloured houses. There are two things on my radar when I am here: 1. Beach 2. Food. This is a food blog so let’s focus on the food; with the time I’ve spent here, I’ve become quite familiar with Mediterranean cuisine. While I would by no means consider myself an expert (there is always more to learn about everything), I do enjoy cooking and eating when I’m visiting the island (where I happen to be right now). Checking out the local farm with freshly picked produce, picking up round zucchinis and vleeta (also known as amaranth greens), browsing every aisle, very slowly, in the grocery store (much to the chagrin of the locals who are in and out within minutes). Cooking in another country, in an unfamiliar kitchen, is almost like discovering a whole new world. While I am in Greece, the flavours I’ve focused on in this Mediterranean pasta salad recipe fall more on the Italian side of things. You’ll recognize arugula, sun dried tomatoes, artichokes and cherry tomatoes, which are all ingredients you’d find on an Italian antipasti platter more so than a Greek meze platter. These are simple ingredients that are fresh and full of flavour and can be used in a myriad of ways. If you’re looking for a healthy and light dish for the remainder of the summer, look no further than this Mediterranean pasta salad. It also has one of my absolute favourite greens, arugula, in this dish. I love the peppery, fresh notes it gives the past salad. This is nothing like your typical creamy, ranch pasta salad, but instead a fresh take on a classic summertime favourite. 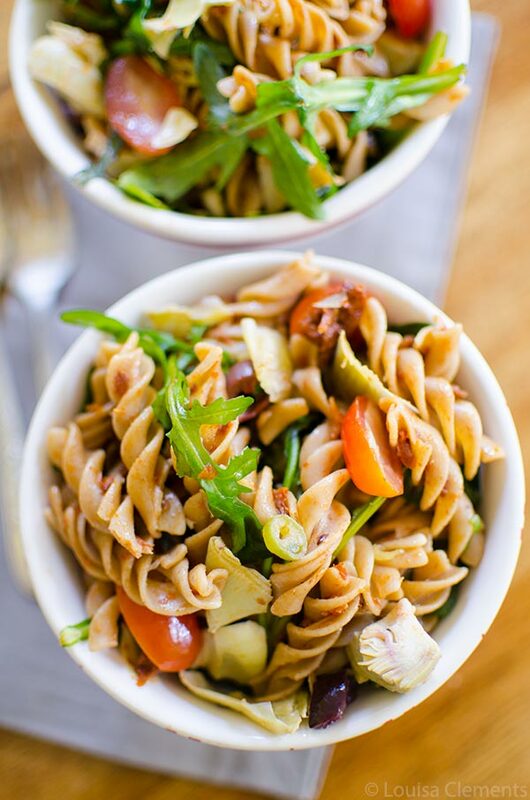 Loaded with fresh Mediterranean flavours, this Italian inspired pasta salad uses arugula, cherry tomatoes, sun dried tomatoes, and artichokes to create a delicious flavour profile. Simple and perfect to take for a work lunch, this Mediterranean pasta salad is best served cold from the fridge. Cook rotini according to package directions, allow to cool. In a small bowl, whisk together reserved 2 tbsp of oil, garlic and white wine vinegar. 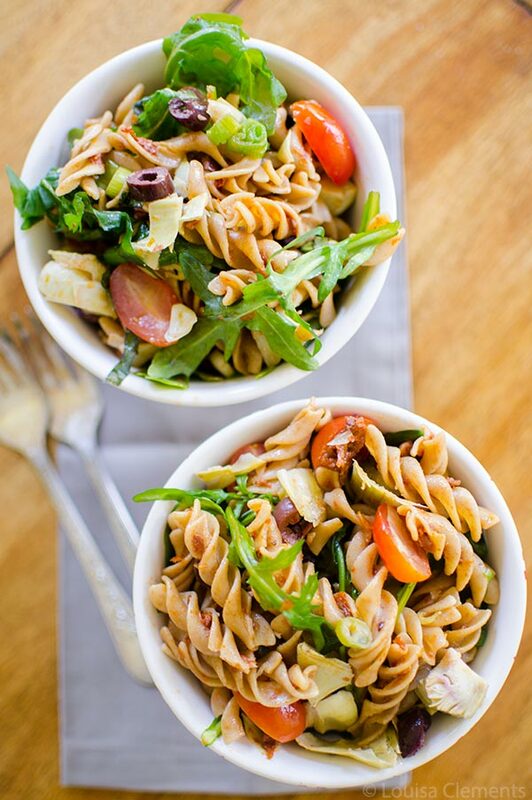 Toss rotini with dressing, arugula, cherry tomatoes, green onions, artichoke hearts, kalamata olives, basil and salt. Enjoy this Mediterranean pasta salad, I know you’ll love it! So tasty Louisa - thanks for another delicious recipe that is easy to make! Thanks Chrissie, glad you enjoyed it!